RAGETRADES! 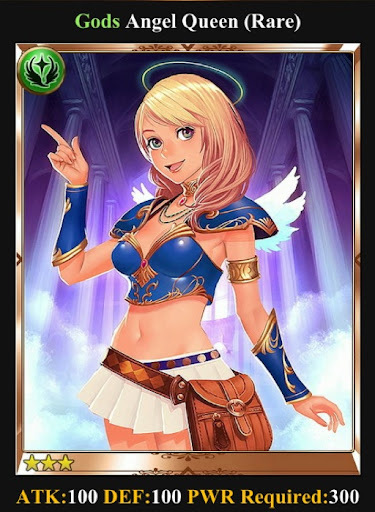 YOUR SOURCE FOR RAGE of BAHAMUT INFO, HELP and TRADES: Benefits to Enhancing (Leveling) Your Cards Before You Evolve. So, is there any benefit to enhance/leveling your cards before you evolve them? A way to make your cards stronger is to evolve them. When evolving you take 2 cards of the same name and merge them in a new card. Most cards can be evolved 3 times while some special cards can not be evolved at all. When evolved 3 times the card raises a rarity level and gains a new name. First off, the level and skill level of your non-Final Form (a card not in final evo stage, 4th stage) will be reset after evolving. With that being said, when you evolve a card at level 1, it will evolve up and retain 5% of the ATK and DEF of the level 1 evolve and level 1 evolver cards. On the other hand, if you MAX Level one or each of the cards, it will contribute 10%! after you add the 5% more bonus ATK and DEF from max leveling, it turns out to be a pretty significant amount. Now on top this, you also have the possibility of using multiple sets of max out cards to get an even higher bonus. For instance, instead of evolving 4 cards, you could evolve up to 8 utilizing different combinations. Evolve "card++" with Evolver "card++"
Here are a few examples of more than 4 card evolving in this image. I would like take the time to formally apologize to Zebriah, I found these photos before on picassa and were unaware that she was the one who created them, TY so much for your hard work! So let's talk about how the percentage of max evo changes your def and attack. Say you evolve four cards together without enhancing. When you get the final evolution, you enhance that last card to max maturity. This will be our base number to measure what combinations we can do to our cards to make them more powerful. In case of the Normal Demon Cu Sith card, the unevo card has an attack of 390 and a defense of 410. That 4 card Final form without max enhancing each Evo stage give you a Final Form of 1850 max attack and a max defense of 1944. Now, if you were to collect 8 cards together and evolve them. Once you max the final form (and only the FF) of this 8 card evo, the Product is a [Mad Dog] Cu Sith the final stats would be an attack of 1875 and 1971. A measly 6% gain overall. However, if we go back, going with four cards again and making them all a max maturity before and after each evolve stage, the FF max attack is a staggering 2,453 while the max defense is 2,579. That's a 155% bonus. The last thing we can possibly do is to take 8 cards, enhance each to their maximum level before evolving (17 cards total maxing out), and evolve. The FF Cu Sith is now 2,783 attack and the defense is 2,925. The percentage gained is 239%. Now most people are shrugging at that, saying they have cards with base stats higher. Well, let's take Tiamat then. Base stats are 3,700 attack and 3,150 defense. 4 Card, Last Enhance = 17,530 attack, 14,925 defense. 8 Card, Last Enhance = 17,779 attack, 15,134 defense. 4 Card, All Enhance = 23,243 attack, 19,789 defense. 8 Card, All Enhance = 26,384 attack, 22,463 defense. Keep in mind that max evo'ing takes a lot of cards and money. Cards like the Angel Queen, can be helpful in be helpful in your enhancing process. This card alone will boost your enhancement up 4 levels on your way to maxing. So when is it appropriate to max evolve 4 cards or more? My personal recommendation would be only cards first stage (unevo) high rare and up cards. Anything lower than that is going to be too insignificant in my personal opinion. In addition, I would even go as far to say only max Evo cards that you know you will be using often in your attack or def deck. Just to clarify things I already have a card I want to max out actually hes a High Rare full evolved Minotaur since I just read your blog I know I did something wrong. 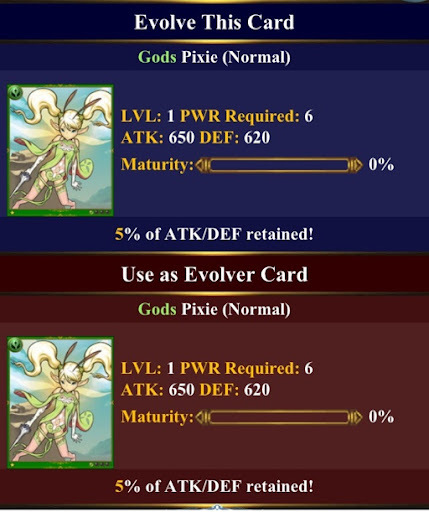 "Is there any difference in using this Normal Cards as ENHANCERS to level up my Mino or should I evolve them first and get High Normal then use them as Enhancers to get better result"
Before your Minotaur is in final form, I would only use normal and high normals without skills to enhance. Save the HN cards with skills for when ur Mino is in his final form. The reason being, you can only increase your skill level by enhancing with cards that have skills or devil queens. That's it! Always double check the skill boost chance of increasing before hitting the final enhance button. My recommendation is to not try and enhance your skill level until its over 50%. Higher if u want to be sure. Keep in mind, the higher your cards skill level, the lower your probability will be. In other words, If you're really close to 100% Skill level increase going from level 2 to level 3, remove a few cards with skills to save for later when it takes more cards or cards with better skills. Also if you are using demon queens to enhance, never waste them going to levels 1-4. Each DQ will always give you a 50% of skill increase no matter what your skill level is. So save these for later. Anyway so just want to clarify for feeders or normal card enhancers it doesn't really need to be High Normal (im talking about without skills) just normal cards from area 2 will be a good enhancers meaning leveling up from level 1 to 60? No need to evolve those Normal to high normal to get the maximum exp. For example is If I have 4 Goblin(normal) cards should I evolve them to [IMP]Goblin (high normal)or no need? I will just feed them to the Mino or any other cards to get it to max level 60/60. Wow you are full of excellent questions! I love it! To answer your question, no it doesn't have to be a high normal to enhance any card. Although, the higher the attack and def numbers are, the faster the card will mature. Evolving the cards first does do a few things for you, since it raises the attack and def it will accelerate the leveling card maturing. But not so much of a difference to do it for regular leveling (non-skill leveling). But, you do want to get each of your cards through all four stages of evolution at least once. The reason being is the archive bonus. This determines how many cards you are allowed to carry in your deck. Now when it comes to skill level enhancing, once you get to those higher levels where the probability starts to drop, evolved skill cards will make a slight difference. Which can be important bc you are only allowed to evolve 10 cards at a time. So in my opinion, it is not worth the money to evolve cards for a more accelerated leveling rate. If you like play around enhancing one card in each evo stage at a time, I personally have not done this but would be interested in knowing the exact results. Greetings, I do not mind referencing my work but please credit me with a link back to my original post. Thank You and keep up the good work of condensing information to a single source. Couldnt you actually use 10 cards at max lvl before/after evo to boost even more? Use a non evolved on both your ++, to get ^ +++, then evo those two for an even bigger boost to ff? Yeah, sry, im tired. I still cant figure out why I cant beat anyone tho, lol. I have only needed the blue key for a while now, but I can't win for anything. Also regarding feeder cards to level, purely from a cost point of view on my high rares , it worked out cheaper overall to evolve to hn before using to level.exanple. I used 10 goblin cards normal and it cost 11.5k to use them giving around 220% xp. I evolved the same 10 cards to ff goblin x2 and goblin ++. Cost 3.5k to evolve but then using to enhance cost only 5k totaling 8.5k and gave same amount of xp. although this is not a lot of money if u do this a lot and remember takes a lot of cards to level hr and above , this figure soon adds up. Ok so the final form will have an additional 2,110 ATK if perfectly evolved this way.. This has your final form getting a 1,638 boost at final form. So there is only a 50 ATK point difference from using 6 cards vs 8 cards.. but a 400+ difference doing it with the minimum 4 cards.. I'm not sure all the time and effort doing 8 is worth it.. but only using 4 seems pointless too.. I also tested rarity for feeder cards like the last poster. Also your site rules. Keep up the good work! thanks again for the daphne trade! may i ask some advice? (im not sure if my comment went thru in the game). i max enhanced my original daphne after reading some reviews (that i now know were misleading). now that i have the 2nd daphne, should i evolve now or wait until i get more daphne's? and use the max enhanced one last? does that matter? 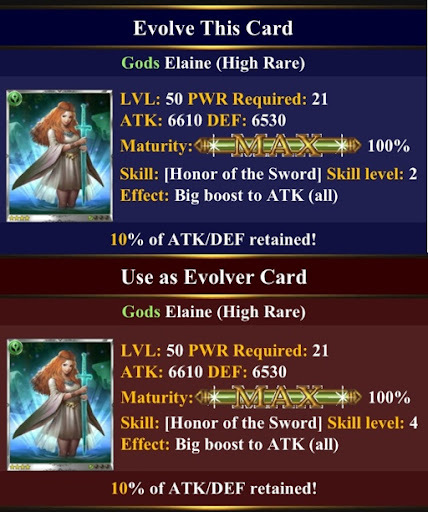 If you want to max evo Daphne, you could do it with 4cards (anymore is a waste in my opinion on evo HRs). Estimated Cost. throughout the whole enhancing process of a rare before it becomes an HR the avg cost is approx. btwn 5-25k for every 10 cards (lower in the beginning, more at the end) which gives you roughly 3-4 levels with Normal Feeders. So You have to get just one daphne up 40 levels 6 times for a 4 card evo. That's around 100k per each max. So plan on spending around 600k just for a 4card max! More if you want to do a 6.
another question. sorry! with my daphne goal in mind, would u hold out for trades that strictly involve daphne if you're being offered a rare card u already have 1 of? Its just i got 8 succubus from my brother and i had only enhanced 1 to max maturity. And then i evolved all of them. What a waste ;( maybe i should sell this succubus and try to get 8 new ones right? Or shall i just enhanced it to full maturity and use it till i get my hands on some better cards? It's worth to enhance the "ghost rider" (treasure HR card)? if yes, It's worth to use skilled feeders ? Any difference between HN o Rare as feeder ? Yes, treasure cards to good to enhance if you are a lower level with not a lot of Evo'd SRs and up. Otherwise, don't. As for feeder cards, the higher the attack or def of the card, the more it will enhance. Doesn't matter if it's rare or not. Your posts are very helpfull !! Someone asked me my alluring angel, I want to do a fair request for a fair trade, so how much is worth ? I know is a treasure card but also has a very good skill so, how many rares or hps it's worth ? Am wondering if it is worth to evolve feeder cards like from N >HN before using it for enhancing? Go check trading strategies comments. I answered this question in conjunction with the bunnies. I was wondering if i should go for a 6full for Luciella since i managed to get 6 of her, or wait and see if i can manage to get 2 more? How much of a difference in stats would that be if I go 6full. Do you know if there is a different between using feeder of your realm or jsut random ones? I see a lot of post asking for stuff like "god realm feeders", why is that? Need advice...I'm leveling up Dark Night Luci's do y'all know what card combinations I can use to guarantee I get Exelent Enhancement every time...I've knowticed that that just about doubles the experience you get. If I enhance a god card with other god cars only when enhancing, will it give me more experience and be cheaper then if I enhance the god card with all demon cards? Not sure if this has been covered in previous posts (I didnt read them all). But enhancing your card will not be affected by what cards you use. I enhanced two identical cards with different classes (i.e. : god, demon, man) and varying levels (i.e. : normal, high normal, and rare). They both ended up with exactly the same score at final enhancement. Where you can make a difference is how many cards are fullly evolved before using it as an evolution. To be more clear, the more cards you max out before a final evolution, the higher the final card scores. For example, evolve 4 cards to its final form then maxxing out will give you the bare minimum for the card. However, if you max every card at every stage you will get the max potential of the final form. But bear in mind. Miinimal stats are 85% of true potential. Getting 8 cards and maxxing each at every level will give you 100%. That may not seem like much. And it isn't for low level cards (normal, high normal, rare). But when you're dealing with High rare and above, I recommend getting at least 6 of the same card, then enhancing, then evolving. It's very pricey. Ideally you would do it with every card. But at lower levels the extra amount gained does NOT justify the expense. Only do this with top cards that you will keep. Thanks for all the good advice - appreciate the work you and others have put into creating these guides. Question, I am still murky, even after reading about it, on how best to evolve cards! Can I just clarify my understanding? Any card can be used to enhance a card. I get that it is not worth enhancing low level cards and to really only enhance cards with a level of rare and above. So far so good? Is maxing out a card when you have enhanced it to its maximum? If not, I am really confused! If yes,then does it matter what cards you use to enhance with? It must do, since I have done some enhancements that give me an "Excellent Enhancement" message and increase points whilst others have very little effect. My question therefore is, what are the best cards to enhance with? I have seen lots of diagrams about evolving cards but not about enhancing them. Is this because there are just too many pathways or have I not found the list? If the former, are there any tips as to what to enhance what with? e.g. only stick to men, demons or gods. Also, when cards have skills, should only the same skill be enhanced or can you mix and match and still benefit? Sorry for the long post, but I really want to nail this! I'm new to this about evolving strategies I have 5 dark knight luciella 2 fully maxed and combined and 3 maxed can I combine all 5 to the final stage? I've been trying to find an answer to this question, but have come up empty-handed. I've max enhanced some FF cards(ie Dark Knight Luciella) but didn't really work on feeding her HN skill feeders to increase her skill level. THe game allows to enhance her with HNs with skills, does this mean that even though she's max enhanced i can still work on increasing her skill level? I'd like to know so that I don't waste HN skill feeders for nothing. I have a question, when doing an incomplete evo, like not 4-7, 6-11, or 8-15, which cards do you enhance, the bases, the pluses, or the plus pluses? Mathematically, enhance plus plus. Reason being you get more % left after the evolve. I'm too lazy to work it out for you but yeah. I recommend that you finish an enhance as partial evolved cards sell for very little. I'm curious about this: I have been skilling some cards and i realized that I get skill ups more often with a set of 10 skilled feeders. Because of the current skill level and the fact that I use high normals only, is it worth it for me to use high normals when the skill up chance is 2% per? I have a dragon++ and a dragon in my inventory. When i go to try to evolve it, the card doesnt show up on my evolve list. What would cause this? And also the dragon++ has a golden lock beside its name what is that? Any help would be appreciated and thank you.